The first seven articles reflected on the events of 9/11/01 and the five years that have elapsed since, through the words of one victim’s father. Originally posted in the San Gabriel Valley Weekly in 2006 Part 1 Part 2 Part 3 Part 4 Part 5 Part 6 Part 7 Today’s article is brand new for 2011, the ten year anniversary. by John V. Napolitano, Sr. I will be at the Trade Center for the 10 year Anniversary, Mayor Bloomberg said that there will be no Prayer said at the Memorial. I know that many of those who were trapped and dying on 9/11, prayed that God would either spare them from their suffering, or take them quickly. I am sure that many Firefighters and Police Officers Prayed that God help them in their Valiant and Courageous efforts to save Lives, and help protect them. 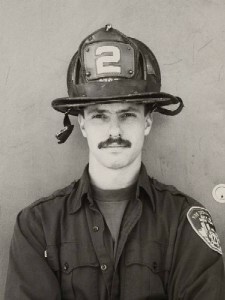 The last time any one of us in my Family heard from my Firefighter Son, Lt John P Napolitano from Rescue 2, is when just before he and his team left Brooklyn to go to the World Trade Center, he called his Wife at work and left her a message on the answering machine, a short simple message..he said that he loved her..then blew her a kiss.. that was it.. we never saw him again. I spoke to an eyewitness who did see him for the last time, she followed the Rescue 2 Rig through the Brooklyn Battery Tunnel, and when they got out, before they strode into the North Tower, they secured whatever tools they would need to help them help others, gave each other knowing glances, looked up at the danger ahead, and without a moment’s hesitation walked into the Horror. I know my Son thought of his Wife and two little Girls, of his Sisters, and his Mother and me..his whole Family.. but I also think that he Prayed, not only for God to help him save Lives, but if something was to happen to him..to look out for us. When I got to the Trade Center with my Best Friend Lenny, I prayed to God to help me find my Son, I wrote a message in the Ash of Ground Zero, to my Son, and I prayed to God that if he already had my Son, to let him see my words to him. Lenny and I find a young Women under a Steel Beam, we make a Cross from the Debris, place it upright near her to mark where she was..and I Prayed for her. On September 23rd, Lenny and I stood at attention, as the Bodies of two Fallen Firefighters were carried from the Rubble, and I Prayed. Later we would find out that one of those Firefighters was Lt John Crisci, Lenny’s Brother. So I say this to Mayor Bloomberg and all the Politically Correct People who think like him, is that your naivete is only overshadowed by your hypocrisy.. 9/11 is about Prayer..it is about Muslim Terrorists who killed thousands and will kill thousands more because they do not believe that People should Pray as they choose, or not at all..it is about People who Prayed to God to help relieve them of their suffering..of Hero’s who Prayed to God to help them save Lives, or look after their Families..of Rescue Workers, First Responders and Volunteers, Firefighters and Police Officers, who Prayed to God to lead them to finding someone alive, and those of us who Prayed over someones’ daughter who was no longer alive. 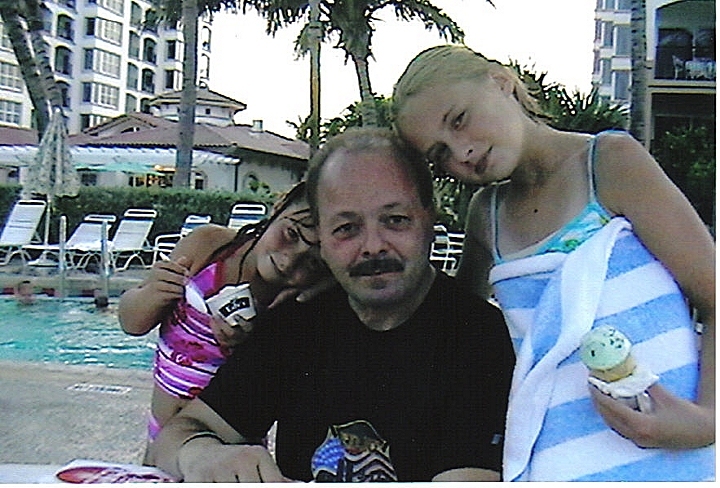 John Napolitano, Sr. with John, Jr.'s two daughters, photo courtesy of John Napolitano, Sr.
those who died in our place and to Honor the Memory of the Brave Firefighters and Police Officers and First Responders who gave their Lives in their efforts to save them, and to Pray to God to keep them at Peace..until we see them again. When Lenny and I get back to the Trade Center, I will talk to my lifelong Friend, Lt John Crisci, my Son’s Schoolmates and Friends, Police Officer Glen Pettit, Firefighter William Mahoney, Firefighter Peter Brennan, and I will talk to my Son Lt John P Napolitano, FDNY, Rescue 2, and then I will get down on bended knee..and I will Pray..
1 Comment on "A Hero, A Tragedy, and a Father’s Love, Part 8 in a Series – New for 2011"
John was one of my oldest friends and cannot remember a time in my life I didn’t know him. I miss him and can’t even imagine how his family feels. I saw Mr. Napolitano 3yrs after it happened in a restaurant and he hugged me and I cried ,he said” it’s ok Russ he was your friend and remembering him is what matters”. As I write this I am crying, I will never forget my friend.